Are you pursuing your engineering graduation in computer science or information technology, looking out for doing internships to get your career ahead? Then the first name that should come to your mind must be Cisco! Getting into Cisco will be like getting yourself in the world of networks where you have ample opportunities to land a full time job. At Cisco, you will be exposed to trending systems through hands on experience and learn more from professionals. Cisco is world leader in networking with around 35,000 employees around 115 countries. It provides networking solutions to service providers, businesses, corporations, government, and educational institutions. These solutions connect people, computer and computing devices, that allows them to access and transfer information via internet regardless of time and place. Around 86% of internet traffic is governed by Cisco with many business depending on it. Cisco is known to develop, manufacture and sell networking hardware, telecommunications equipment and other technology products and services. Though it is headquartered in California, it has branches all over the world. What Does Cisco Provide for Students? Cisco aims to provide creative and talented computer network specialist through training. It is known to attract students of various categories to improve their career through its internship programs. These programs are structured utilizing the knowledge of the subject they have learned in classrooms, so that they visualize its setting practically. In other words, it helps to bridge the gap between the knowledge and its application. On the whole they intend to improve the economic opportunity worldwide. Headquartered in San Jose, California, Cisco system.Inc is one of the top manufacturer, seller of IP internet protocol products that is related to the IT industry on global basis. Cisco builds routers that connect public and private IP networks for mobile, data, voice, and video applications, also for different security products designed specially for computer security. Cisco Systems, Inc, looks for bright and talented students who are interested in learning about the field. Cisco also offer paid internship, which is another way to meet enthusiastic freshers who always carry that go, get it attitude. Cisco Systems, Inc., provides best in the industry hourly wages that would differ depending upon the position and responsibilities of the employee.The Cisco internship salary are considered best in the market. Not only this , your internship with Cisco can also turn in full time employment, provided your performance must be good. Cisco is one of the top entity and works on Internet connectivity and especially on the aim of connecting the unconnected networks. The company has maintained a webpage on which you can apply the internship program at Cisco. Moreover the Cisco company has offered internship in various field like hardware and software engineering, IT, marketing, supply chain operations and sales. So you can choose any one as per your interest. Cisco Systems Inc, is one of the top California based conglomerate that provides IT and Networking services to its clients all over the world. What does Cisco Internship offer? The employees or interns who work there are known as cisconians. They are provided with high class training and high performance culture that help them get many learning opportunities which will helpful for you in future. Get associated with cutting-edge technology as it evolves and develops. Network with employees at Cisco employees. Maintain contacts and work and learn with the best top experts. Join with international brands to resolve business issues. Handle projects to deliver on contracts with customers, communicate effectively with stakeholders, and meet deadlines. Design, test, and deploy our technology, learning the engineering behind it in order to break and fix it. Review our data to know how we perform our work. Do some social activities like fundraising, volunteering, and raising awareness of local causes. As student, you may be always on the go to attend any event related to networking and systems. But in the go, you would stumble upon workshops that Cisco organizes which is very helpful for you to know about the details to apply. Moreover, attending to these helps to gather information or collect contact details of any company offering internships. Cisco organizes many events at different universities offering short term certificate program. Besides, they also convene seminars and workshops at various universities. As students, you need to update yourself about the workshop or seminar that Cisco conducts and participate in it. For this get permission from your department earlier, so that you don’t miss out. Being in third year, you need to develop attitude of building relationships with various firms so that you know, what is required for you to get an internship. Moreover, attending to seminars and workshops help build better relationship. If you want internship at good firm like Cisco, then you need to talk out to the recruiters to help you out. Definitely this relationship built would bring the dream to reality. Getting into a well renowned company does not go without persistence. So get going and start early! Before the announcements of the internship programs, you need to learn what time do they offer and at which period, so that you can prepare yourself well before the schedule. Get to know, from your seniors or through website, what type of internship they offer and what do you require to know. It helps to prepare yourself ahead so that you get selected. Besides, you would need to refer to related books or publications for self-preparation. 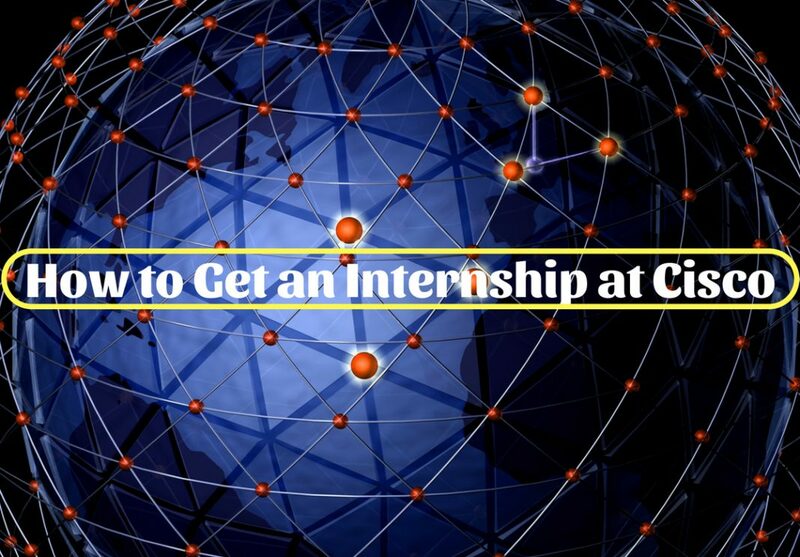 As Cisco offers international internship programs as well, be aware of the necessary skills that are required for it. These programs are offered to students studying at leading universities to experience working at the main headquarters alongside other Cisco employees. It is an opportunity for student returning home to complete their degree with greater success in their academic and move ahead in their career. Go through the website to know more about the company so that when you have face to face interactions during seminars or workshops, you have your queries ready at hand. Also, it helps you to clarify your doubts during campus visits by the company representatives. As companies offer internship for different categories at different periods, you need to identify what type of internship do you require and at what period. Sometimes, you may be occupied with main course during that period which means that, you need to select an alternative program or wait till next term. If you are keen to pursue at that period, then you probably would need to get permission from your department. Getting into Cisco for internship requires you to have certain skills and experience. By knowing about the requirement you could polish your skill sets so that you could get through. If it’s international internship, then there are certain criteria to be fulfilled along with other aspects as well. It’s always better to go through the features of the program before making your selection. As you are preparing to apply for internships at various firms, you need to prepare your resume earlier so that you don’t get panicked at that moment. By attending to resume building workshops at your campus, you should start building your resume. In case of doubts, seek assistance of your seniors who have been exposed to submitting applications and share their experience. Still not sure on how to build resume or fill up details or know what should be the contents, then it’s better to seek the help of third party services that offer advice on career related aspects. Sometimes, the service providers make your resume stand out from the crowd! While making your resume, do not add contents that you are not sure about or you are not familiar with. Do not add qualifications that you are not exposed to. It would cause you to be disqualified for faking during interview session. It’s better to have a balanced approach. To make your resume stand out, define the positions you had taken up and projects you had undertaken. Give details about the assignments and what you have accomplished. Also make sure you have detailed your skills. Mention computer languages you know and also dialect languages. Don’t forget to mention the challenge or the challenging roles you took up. Through these details, the recruiters would be aware of your skills. Mention all the projects you have done clearly so that you know how to answer them. Provide appropriate details so that it is not too little nor too detailed. If you are sure about the answer, then mark it in black and white. Attending workshops and seminars along with seniors helps in getting connected. Besides, attending events organized by Cisco paves way for get connections to previous interns who would share their experiences and knowledge. Get to know them and learn from them the different techniques used by them to get through the interview sessions. Also such interactions, details their experience about the internship and what they had learnt. Social media provides a huge platform for linking people of same thoughts. But LinkedIn is the best platform to connect to professionals. You could search for Alumni from your university who are currently working at Cisco and connect with them. Such linkage helps you to get closer to them and become a part of it. From your alumni or seniors, get to know about the process of interview. Most of the time it involves almost 2-3 rounds of selection process. First round is mostly question answer session while the second round is interview. Learn about the posts or programs offered. While at interview, be ready to ask them questions of your concern. For this you need to be prepared about the program you are interested in and show them your interest by questioning them. In case you need to relocate, then you need to know about the amenities that would be provided and prepare yourself for it. By reviewing the aspects given above, it is clear that you need to be pro-active for getting selected into the internship program. The internship plays an important part of the academic course. If you find that you have the necessary skills and is well equipped with all the information required, then what are you waiting for. Start applying for your intern by unlocking opportunities and wish you the very best!! Next articleRacial Discrimination at Workplace – How to Avoid?